Shank's Mare is teaming up with our friends at The John Wright Restaurant. 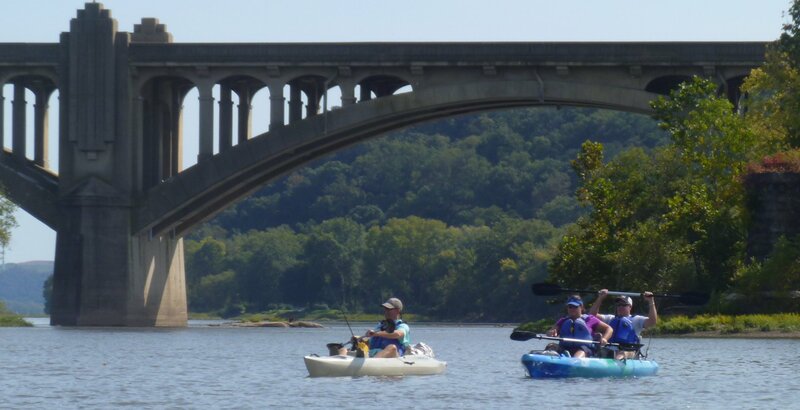 Enjoy a guided kayak tour on the Susquehanna River at the beautiful Veterans Memorial Bridge in Wrightsville. Explore the footprint of the old Susquehanna Canal and the remains of the famous bridge burned during the Civil War. Then head to the patio at John Wright and enjoy their brick oven pizza. This tour meets and leaves from the boat launch at John Wright in Wrightsville. Guided Tour. Rental Kayaks are available at an additional cost. If you require rental kayaks, please call the shop at 717-252-1616 to make arrangements and pay your rental fee. Paddlers meet at the Wrightsville Boat Launch located at the John Wright Restaurant. The pizza patio is open for dining following your paddle tour. Shank's Mare instructors have years of experience guiding paddlers on the Susquehanna River and elsewhere. They are happy to not only safely guide you on your tour but give you highlights about the beautiful Susquehanna River at Wrightsville. Fee - includes guided paddle. Rental Kayaks - $29/Single Kayak, $39/Double Kayak. Children under 12 years - $15/Child*.